We are only about seven miles (20 minutes drive) from The Eden Project and approximately 14 miles to either coast, with Land's End around an hour away. The Lost Gardens of Heligan, another very popular attraction is about 30 minutes drive. 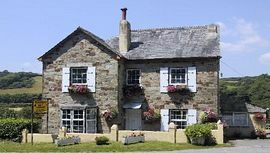 Bodmin town is less than three miles and the village pub just a ten minute walk where you can sample the locally brewed beers and choose from an excellent and varied menu. Also in the village of Lanivet is a mini market, a post office, licensed fish restaurant and a church. In the church yard there is a stone which claims to mark the centre of Cornwall. The famous Saint's Way runs through Lanivet, and the Camel Trail is only about five minutes drive. Both these are very popular with walkers, The Camel Trail also being a favourite with cyclists. £28 to £30 per person per night. We are closed for the Christmas period. Thanks for the warm welcome - comfortable room and great breakfast. H.Bulmer - Falmouth. Thank you for your warm hospitality. We will definitely return - promise! Jim & Jackie - Hither Green, London. Go through Bodmin (A389)then straight ahead at the two sets of mini roundabouts towards Lanivet. Follow the Bodmin by-pass (A30) and leave the A30 at the Innis Downs exit. Follow the signs to Lanivet. Go through Lanivet village and we are about a quarter of a mile up the hill on the left.